Conquering Triathlon X, The Hardest Iron Distance Course in the World! Swim 2.4 miles (3.8km) around the head of Windermere, England’s longest lake, before tackling the famous Fred Whitton bike ride. At over 12,000 ft (3,700m) of ascent the Fred Whitton route is the hardest bike section of any ‘iron man’ event in the world. Transition from Bike to Run to complete the 26 mile (42km) marathon to the top of Scafell Pike and back. Climbing over 5,000 ft (1,400m) from the foothill of the Langdale Pikes before entering the high central mountains, traversing Esk Hause and onto Great End and Scafell Pike, England’s highest point. It’s not just the total ascent, 16,994 ft (5,137m) over the traditional ‘Iron Man’ distance of 142 miles (226 km), that makes it the toughest; it’s the severity of the climbing on the bike and run that distinguish The X as the world’s toughest. This is how Triathlon X website describes the course. And from what I experienced…they were not exaggerating! I signed up for Triathlon X in March of this year and began preparation immediately thereafter. Ironman training requires a specific skill set along with a certain recipe of training, but doing a race like Tri X there has to be some tweaking to that routine. The extremely hilly nature of the bike course and the off road aspect of the run required me to adjust my approach to this race. I put different gears on my bike. I had to learn to run with a vest loaded with gear. I rode and ran every hill I could find. I did more strength training. I increased my bike skills by riding dirt. And most importantly I did some really, REALLY long days of training. But there were some unknowns. I wasn’t sure how to pace for a race that was 50% longer than the longest I’ve done. I’d never ridden the roads in northern of England. I didn’t know the route up the mountain on the run. And I wasn’t sure if I could get by on my normal fueling plan or if that would leave me curled up in the fetal position in the ditch. Nonetheless, I was well prepared for race day. We started our journey to England by driving to Calgary for a direct flight to London. Before flying out my wife and I signed up for a local Calgary race. Our goal was to earn a little spending money. I signed up for the Cinnamon Bun challenge, an 8-mile race requiring the consumption of two Cinnamon rolls, one at the 3-mile mark and one at the 6-mile mark. Combining eating and racing is my dream, but the Cinnamon rolls posed little challenge to my race pace. I took the course record by a hefty margin and finished the race with…. well not a cinnamon roll. Trish took a victory in the half marathon as well, although she didn’t get to enjoy downing cinnamon rolls while running. We spent a few days in London and I was freaking out about getting sick. Between the flight, public transport, and the sheer amount of sneezing and coughing going on around me, I felt like I was continuously dodging bullets. All I wanted to do was make it to the start line free of any illness. Later in the week, we drove up to Ambleside, the sire of the race. It was beautiful country. Idyllic English countryside with loads of sheep roaming bright green fields confined by ancient rock walls. Narrow roads with frequent small towns littered throughout. And weather that could provide all 4 seasons in one day. Truly a perfect place to ride a bike, go for a run, or enjoy any outdoor adventure. The race recommended that all competitors ride and run the course before signing up. I clearly didn’t have that luxury. I arrived just two days before the race and only had the chance to ride the first bit of the bike and jog a few miles of the run course. Thankfully I downloaded both courses to GPS units to guide me along the way, as I knew that sometimes as the leader on a foreign course getting lost is ridiculously easy. But I was blind to the technical areas of the course where knowledge would equate to a much faster time. Race day came and hey, I wasn’t sick. Although 4 hours of sleep the night before and a 4:30 AM start time meant I felt like a zombie as I racked my bike. The lake it looked great for an early morning swim. Although I noticed there were no sighting buoys. Generally, races place large orange buoys every 100 to 200 meters and large yellow buoys at the turns. There was none of that. I knew at that point this was going to be the type of race where I’m on my own. Which was okay as I prepared for that, but meant I would need to pay a bit more attention to details. The race director gathered everybody up about 10 minutes before the start. He stated that our job was to swim to a small island (of which they placed two large flags) go around the kayak and do that twice. Okay. As we entered the water it was clear that this was going to be chaotic. A fog had settled about 2′ off the water and visibility was about 25 yards. We couldn’t see the island. We couldn’t see anything. But nobody was going to backing down now. With a countdown we were off. Everybody decided to follow the first guy in hopes he knew where he was going and for a while it was okay. He was following a Kayak who was leading him in the direction of the island, but at some point either the Kayaker got lost or he got away or something happened. People started swimming in all directions. Eventually after some major zigzagging, I made it around the turn with a group and headed back. But as we began swimming back we started crashing head on into people swimming out. So for a few minutes I just swam head up every other stroke dodging going head on into other swimmers. 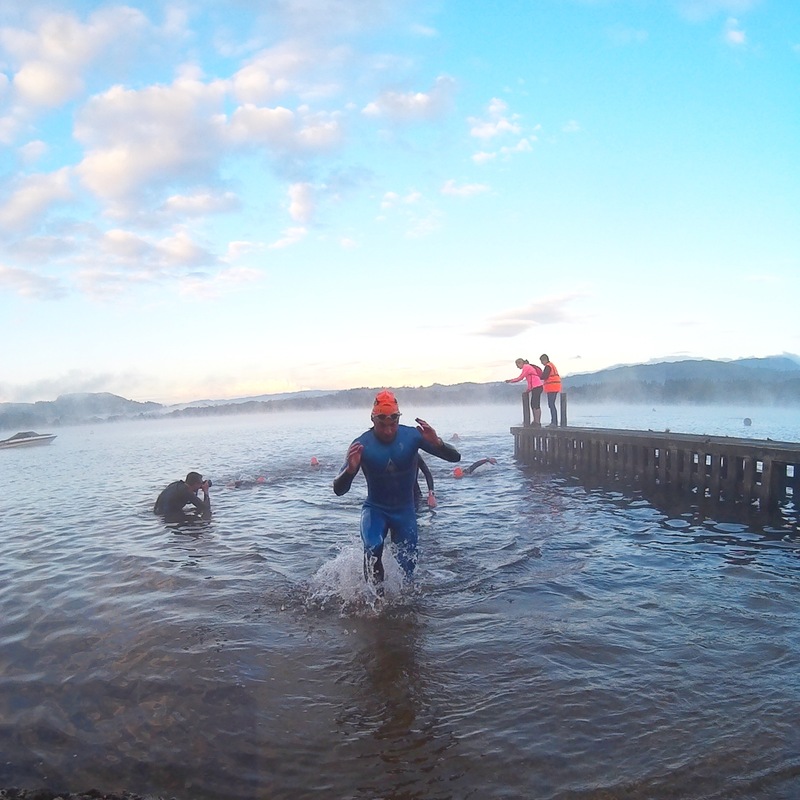 After a lot of stopping and treading water to orient oneself, I eventually made it around the swim course and was out of the water with a small group. Trish told me I was about 20 minutes from the leader and somewhere between like 10th and 20th position. To be honest that kinda worried me, but I went out on the bike with a vengeance feeling as though I needed to close the gap. As we hit the first climb I pushed the pace but made sure not to do anything crazy. My legs felt okay, not as fresh as I would have hoped, but I was still passing people one by one. After the first long climb and descent the course meandered through some flats and into another shorter easier climb. At that point I passed a rider and he said “you’re now in first”. I couldn’t and didn’t believe him. 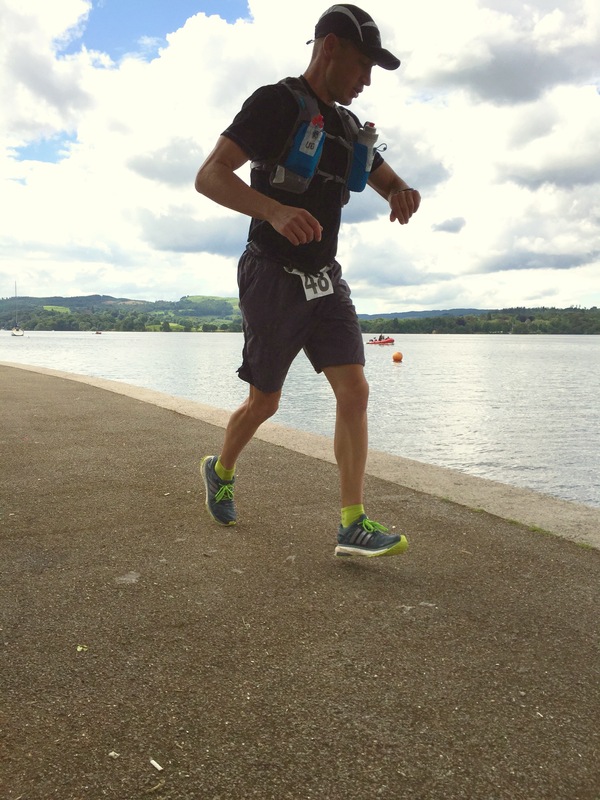 I was only 25 miles into the race, how could I have closed a 20-minute gap? I started to get worried maybe I was going too fast, but I also wasn’t convinced I was actually in first so I continued to push a good pace. Just over mile 30 I went through a small town where Trish had posted up. She told me I truly was leading the race. So I backed off the pace and found a more realistic and reasonable effort. The course wound its way through every type of terrain and roads. Flats, rollers, climbs, fast downhills. The roads would go from divided highway to one lane roads that seemed more like back alleys than roads. The country went from open grazing land, to leafy forest, to pine trees, to lakes, and everything in between. At times I felt like I was in Montana, at times I felt like I was in the Midwest or Southeast, and other times it was distinctly England. It was beautifully fun riding. 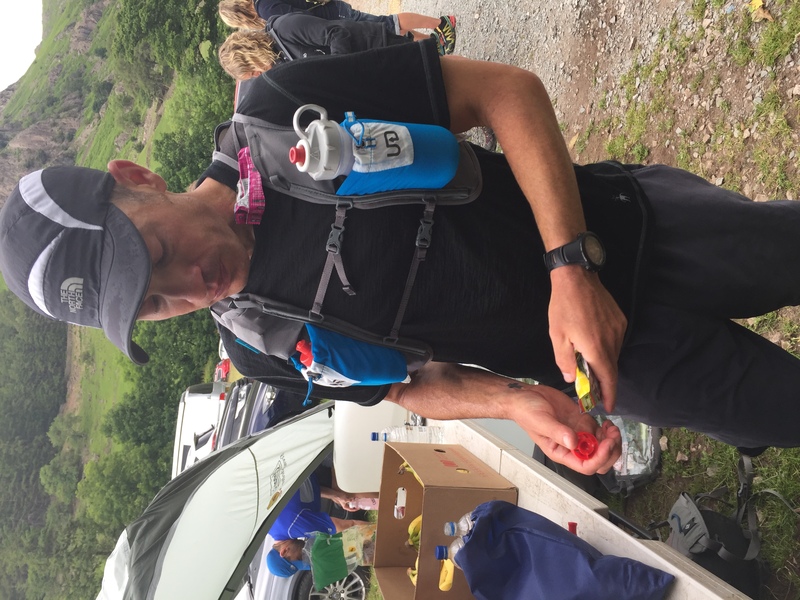 At mile 90 the course transitioned from a fairly flat section into the base of Hardknott pass. This is the hardest climb on the course and one of the top 10 hardest climbs in the World. It is only a couple miles, but grades hit 33% and require a hard effort to get up without walking. For the first time in my life I was actually intimidated by an uphill gradient and had genuine concern about getting up it. Getting up took way more effort than I would normally put out in an Ironman, but I did it without unclipping. I was gassed at the top! Although I had 18 more miles of riding and a marathon to do, I was happy the worst of the bike course was over. and I was banking on some type of sugary drink. That threw off my calorie count. The third aid station was supposed to be at mile 86 but actually it was at 82. I nearly blew by it and had to turn around and go back. Missing that aid station would have been a disaster. I also hadn’t taken enough fluids and later in the ride was way thirstier than what I felt comfortable with. But as I finished the ride I was just so happy I didn’t have any really big mishaps. The course was pretty dangerous. The descents were blazing fast, on rough narrow road, and with sheep scattered throughout. I quickly learned that the adult sheep would stay put, but the babies would get spooked and were unpredictable. I had to hit the brakes and dodge sheep more than a few times. The roads were open to traffic and only a single car width in many spots. Multiple times I would be going 25 mph with my left arm a foot from a rock wall and my right arm a foot from a car going the opposite direction. On a training ride, I would creep by a car that close to me, but racing I’m in race mode and don’t want to give up time. As I transitioned in T2 I was told I had a 20-minute lead. That clearly was good news and meant I could take a bit more time during critical times like aid stations, but anything can happen with 5 more hours of racing to go and I wasn’t taking any time for granted. As I headed out on the run course my legs actually felt okay. The first 8 miles of the run were on a mix of pavement and trail with only moderate elevation gain. But just after mile 8 was an aid and check station for the mountain section. I was prepared for the 3,000 feet I was about to undertake over the next 5 miles of mountain running, but I was not prepared for the rough trail ahead. I’d already gone off course a couple times and guided back on by my GPS and I was totally reliant on it. The mountain section started as rock laced single track. It then transitioned into an endless staircase of rocks. From there it took racers to a summit-ish check station but nowhere near the summit of the mountain. We then got to another summit and I thought that had to be the top. Nope. The trail got crazy from there. There wasn’t a trail, it was a route. The route was marked by Cains (stacked rocks) but in the fog I couldn’t see anything. I was following a black line on my GPS whilst leaping from pointy boulder to pointy boulder. It was surreal. In the mist of the fog I felt alone and couldn’t believe I was in a triathlon. The course went downhill from that point and I truly thought I was lost. If it wasn’t for the continuing black line on my GPS I would have had no idea where I was. I followed it and it took me to the steepest part of the mountain where I nearly crawled to the top due to the steepness of the terrain. At the top was a mound of rocks and different country flags from people who summited before. But I didn’t see a Triathlon X check station. I put on rain gear and stood there for 5 minutes hollering for the Tri X checker. Eventually I saw a guy in a orange vest and he was the check crew. I’d beaten him up the mountain. I got checked in and headed down. Downhill I was running scared. I know how good some people are at running downhill, particularly on rough trail. That isn’t in my skill set so I suspected I was hemorrhaging time. With the fog and no real route up and down the top of the mountain, I also wasn’t sure if somebody had passed me. So I wasn’t sure how far ahead I was. Halfway down the mountain I started splitting at the seams. I’d ran out of gels and water and I was getting really tired. I got water out of a creek but my body needed sugar. I just kept thinking about the aid station at the bottom and getting there as quick as possible. By the time I made it down I was on the verge of completely blowing. In this fragile state, I asked Trish to stay back and come find me if somebody was close. I thought if I needed to step up the pace I could, but would be at the risk of completely blowing up. A better option was to run a mechanical pace and hold off second place. I took what fuel I could stomach and set out on the last 8 miles. This eight miles wasn’t a good time. I really just wanted it to be over at this point. I was slugging out 8:45 minute miles and wobbling around the road like a drunk man. I just kept thinking about laying down and eating food. I took each mile one by one and with no sign of Trish I was confident that winning was a likelihood. As I cruised within view of town I picked up the pace for one last push to the finish line. Then it was over. Second place ended up coming in well over an hour behind me and my time of 12 hrs 42 mins was way ahead of what they thought possible on that course. I had 28 miles running on my GPS from some wrong turns and that combined with the pause at the summit meant I likely could have gone 15 minutes faster. But that was of no concern. All I was concerned with was not having to take another step. All in all, the race was truly amazing experience. I went out of my comfort zone both physically, mentally, and skills wise. Knowing I can do this makes other challenges in life seem easier and more achievable. That is something great that every person can experience by doing something that pushes what they think is possible for them. This journey would never have been possible without the support of friends, family, and sponsors like Power Systems. 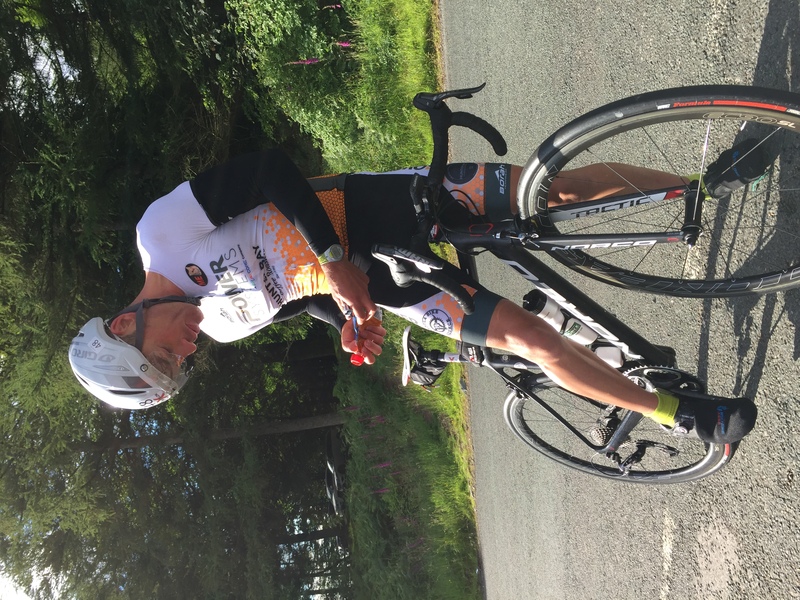 Andy Drobeck is a Professional Triathlete sponsored by Power Systems. Andy has been competing in triathlons since 2009, and made the transition from Amateur to Pro in the 2014 season. When he’s not training or racing, Andy is a full-time firefighter with the Missoula Fire Department, located in his hometown, Missoula, MT. Andy and his wife Trisha have 4 cats together.